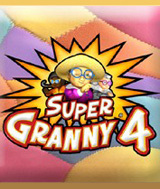 Super Granny® is back and better than ever. Join Kamila, Margaret and everyone´s favorite geriatric superhero, Super Granny, for this all-new, globe-trotting adventure. As Super Granny, Kamila, and Margaret reminisce about their past adventures, help the ladies navigate 6 exotic locales - from ancient Egyptian tombs overrun with mummies, to exotic Alaskan cruises - with everything leading up to a final showdown with the nefarious, and dastardly named, Colonel Hans Foote, the leader of a mysterious shadow organization. With all-new enemies, a hilarious storyline, over 30 interactive items and unique bonuses awarded for in-game achievements, help the ladies run, dig and climb their way through more than 160 levels in this puzzle-solving, item-tossing, addictive adventure. Comments: THIS MY KIND OF GAME. NEVER A BORING MOMENT.